Using delays (or echo) in a mixing situation is not an overly complicated thing but I just think there tends to be confusion around the subject of delay throws. If you are already using delays in your mixes then you’re probably already using a delay throw but you just may not know it. Do you have any rhyming words or phrases that have a delay attached to it? If the answer is yes then you are most likely using a delay throw. 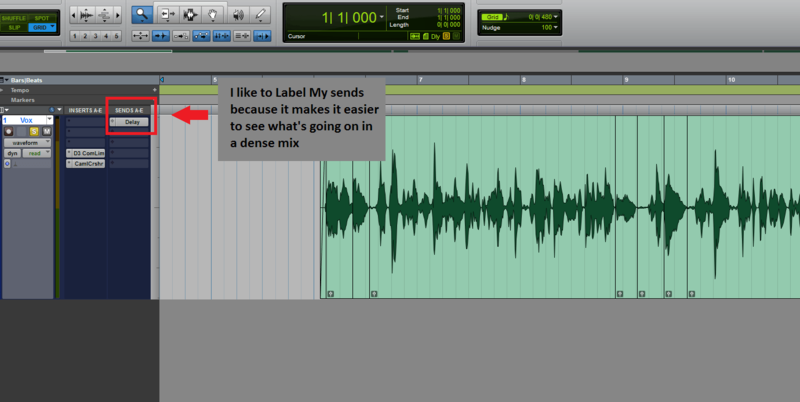 So let’s get into the nitty gritty of it and then I’ll show a couple of examples of how you can use it in your mixes. What is a delay throw? Well a delay throw is nothing more than a triggered delay at a specific moment in a song with the source being a certain word or phrase. The most commonly used delay throw would be a ¼ note because of how pop music is structured. However, that not’s a rule and you should use whatever delay time you feel fits the song appropriately. An example of a pretty obvious delay throw would be in the song Just The Way You Are by Bruno Mars. At about 1:08 in the song, when chorus comes in you can hear the delay throws on the words “face” (loud), “change” (soft), “amazing”(loud), and “are”(soft). This pattern of delay throws is continued on the second half of the chorus. When Should I use delay throws? I really wish there was a definite answer to this question but unfortunately there isn’t. There is, however, some common places that delay throws seem to be used. 1. Dead space – Whenever the vocalist takes a break from singing and there is “dead space” a lot of engineers will use a delay throw to fill it in. Just be mindful because often times songs are purposely produced with a pause in the vocal performance so that an instrument can shine for a moment. Try not to step on that performance with a delay. 2. End of Phrase – This is where the phrase of line is coming to an end. If there is enough space before the next phrase comes in then a delay might fit that pocket pretty well. 3. Specific words – There are times when certain words in a song are very important and using a delay helps to emphasize that importance. If it happens to be inside of a line, than that is where creativity will come in. You will most likely have to time it so it gets the point across but doesn’t clash with the rest of the performance. I’m sure there are more instances where you could justify reaching for a delay throw but those three should keep you occupied for several mixes to come. So let’s move into the examples of how I would set up my DAW for a delay throw. I’m strictly in the box so all my throws are created using a digital delay. I opt for one of two methods, the first being a duplicate of the original track and the second is to create an aux channel with a send. There are some minor benefits using each one but truthfully it’s not so significant that one way is better than the other. I would say just use whatever makes the most sense, you can understand and you can execute quickly. This is easy to do and can be accomplished in a few simple steps. Just click each tab to reveal a picture and explanation. 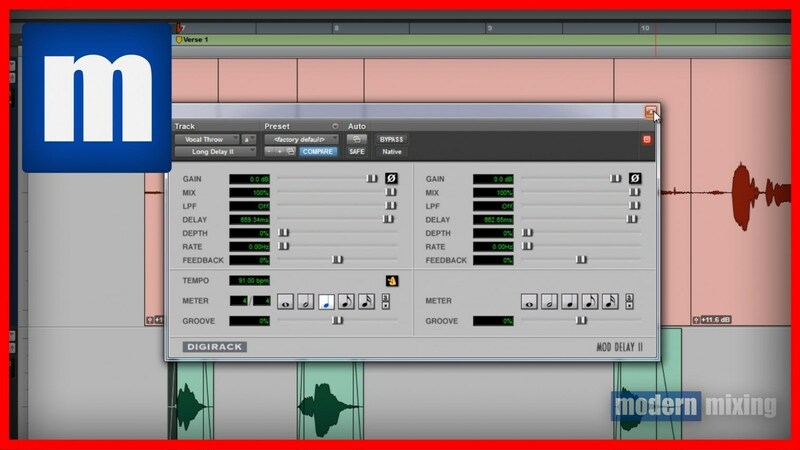 Create a new audio track and put it directly underneath the audio you want a delay throw to be on. 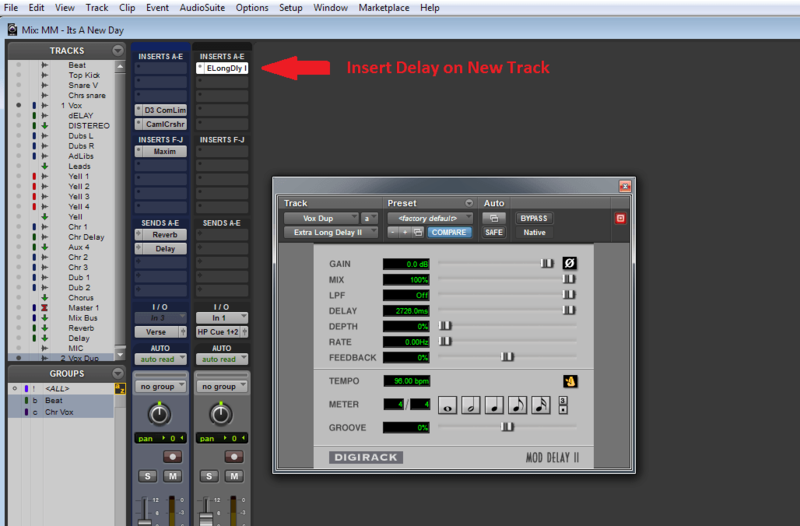 Insert a delay of your choice into the duplicated track. 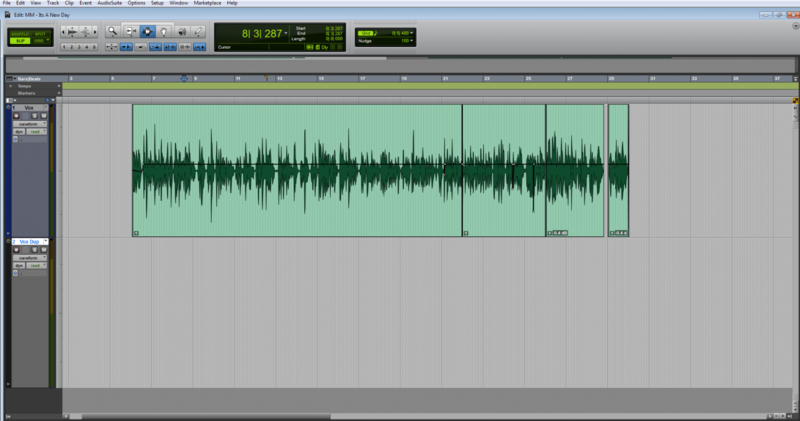 Listen to the original audio and crop out the specific words that you feel would work best with the use of a delay. In this example below I grayed out the chopped words so it was easier to see. Once you’ve cropped your desired words copy them to the track below by holding ALT (windows) or Option (MAC) and then dragging them down with your mouse. Once Step 4 is complete you are pretty much set to go. From here you can select your delay time and possibly add processing or effects. The sky really is the limit. Just keep in mind that certain processing may have to be applied based on the original vocal. One prime example that comes to mind is autotune. 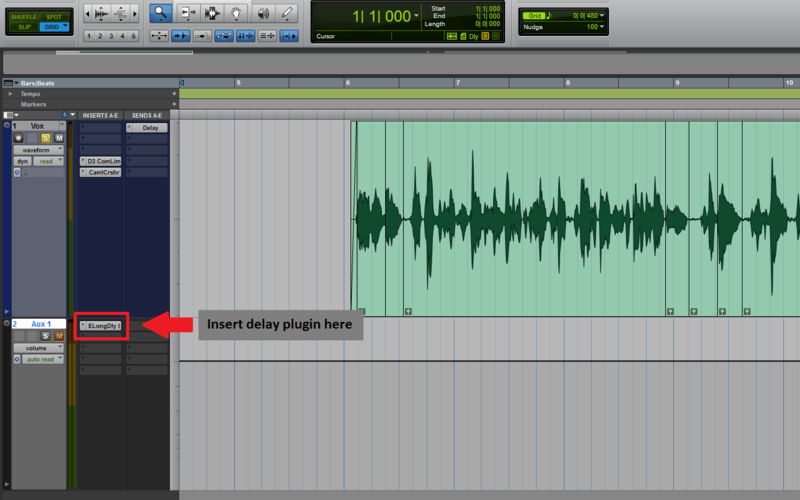 First you need to create a send on the channel with the audio that you want to trigger the delay. Now that we have our Aux Channel created we can go ahead and insert our favourite delay plugin on the Aux Channel itself. In the example below I didn’t rename the Aux Channel but it would be at this point or soon after that I would want to change the name. I would use something simple like Delay, Vox Delay or Verse Throw but just be creative and use something that is easy for you to recognize. This step is very critical in to the outcome of the delay. We are automating the SEND and NOT the AUX. Compare the send to a door in that we are opening up the door at certain point so that we trigger the delay. Once the we let in all the audio that we want we can now close the door so that no other audio is leaked to the delay unit. You might need to practice drawing your automation and you also may need to get creative and fade the automation to get a cleaner signal to the delay unit. You’ll notice in the example that I put my automation right under the words that appeared in the first example above (copying the track) because I wanted to show you visually that it’s basically the same thing. Once all those steps are done you are free an in the clear to add processing and effects on the Aux Channel – Makes those delays interesting. Lastly, the only other thing that I would want to mention is that if your audio requires different type of delays (ie 1/4 note, 1/8 note) than you can either automate the delay unit itself to trigger the appropriate delay setting or you could set up a second delay unit. For Example 1 just create a new track and put another delay on that track. If you are using the Aux technique thatn I would set up a new aux channel and create a new send on the actual audio channel to trigger the second delay setting.